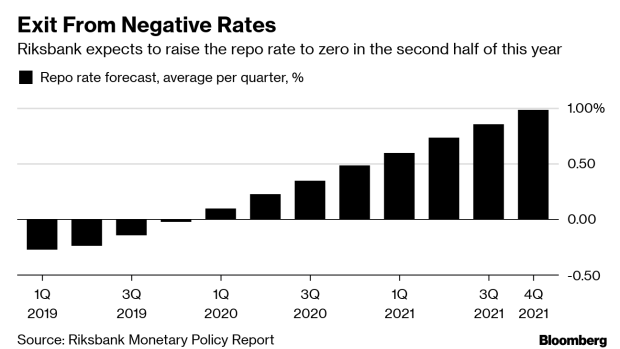 (Bloomberg) -- After raising interest rates late last year, Sweden’s central bank now has little choice other than to wait for a better economic outlook before pushing ahead with its long-awaited tightening cycle. Governor Stefan Ingves and his fellow board members have acknowledged that the economic challenges are growing. He has sought to reassure markets that the Riksbank will pay close attention to all the economic signals before doing anything. For those reasons, the bank is expected to refrain from making any adjustments to its forward guidance as policy makers meet to discuss Swedish interest rates this week. Their talks take place against the backdrop of the Federal Reserve making a U-turn on its tightening cycle and as central bankers in Frankfurt and London have recently signaled more pessimism. “By signaling a next rate hike in September, the Riksbank has given themselves some space to wait and see before potentially changing the guidance later,” said Torbjorn Isaksson, chief analyst at Nordea Bank Abp. All 19 economists in Bloomberg’s survey expect the Riksbank to announce an unchanged repo rate on Feb. 13. The largest Nordic banks also anticipate no change in the forward guidance and that any decision on whether to extend bond purchases will be put off until April. The Riksbank has sought to emphasize that it doesn’t want to slow down Sweden’s economy. Nevertheless, growth is cooling fast after a long economic boom. According to the latest forecast from the European Commission, Sweden will be among the EU’s slowest growing economies this year. High debt levels and sinking home prices are adding to the risks.